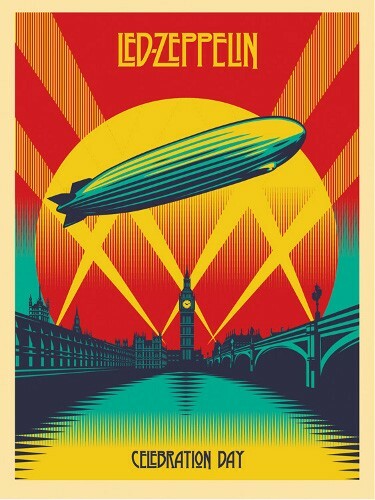 Led Zeppelin, ‘Celebration Day': Win a Lithograph Signed by Shepard Fairey! Led Zeppelin recently released Celebration Day, a film which documents the band's historic 2007 concert at London's O2 Arena. Led Zeppelin took the stage at London's O2 Arena on December 10, 2007 to headline a tribute concert for dear friend and Atlantic Records founder Ahmet Ertegun. What followed was a two-hour-plus tour de force of the band's signature blues-infused rock 'n' roll that instantly became part of the legend of Led Zeppelin. Although 20 million people applied for tickets, the band's first headline show in 27 years was seen only by the 18,000 ticket holders who were fortunate enough to have secured seats through the worldwide lottery. Noisecreep got its hands on a lithograph of the Celebration Day cover signed by its artist, the one and only Shepard Fairey, and we're giving it away to one of you! All you have to do to enter is head to this post on Noisecreep's Facebook page and tell us what your favorite Led Zeppelin song is. You have to "Like" us on Facebook to be eligible. We'll pick a random suggestion and announce the winner on our Facebook page on Monday, Jan. 21. We'll give two other winners a copy of the CD/DVD... enter now! Celebration Day is available in multiple video and audio formats on Amazon.